Consequently, we have seen an influx of homeowners racing out to purchase these products and cobble a smattering of lights together for their yards. As I drive through our neighborhoods at night, I always cringe when I see beautiful homes and properties with a mish-mash of lights that were installed by a homeowner or a landscaper/handyman, with no thought to the overall design. It is very disappointing to see beautiful properties that could be absolutely stunning at night, haphazardly illuminated because that homeowner put their trust in someone who was unqualified to do the job. A beautiful lighting design is far more than the sum of its parts. At Lighthouse® Outdoor Lighting, we train our team members to be design centric rather than fixture focused. Our designers are highly trained and specialize in bringing out the hidden beauty of your home and property after dark. 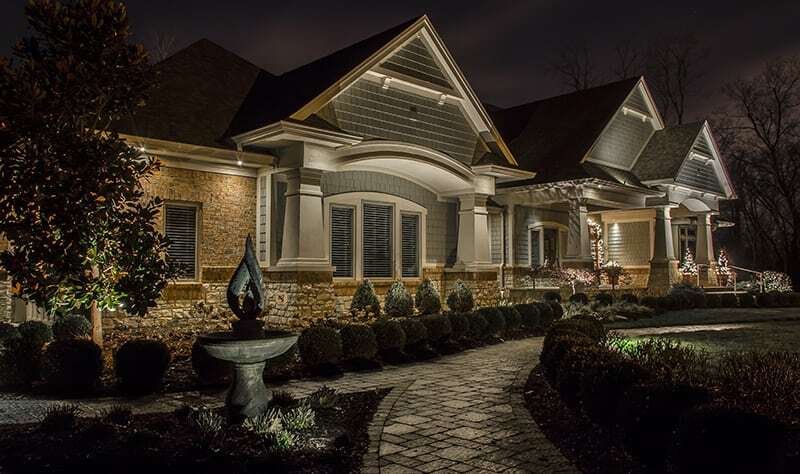 Unlike landscape companies that are really nothing more than a “jack of all trades” (master of none), Lighthouse landscape lighting® designers do only one thing, and we do it very, very well. When you work with a Lighthouse® designer, he brings very specialized training to your project. A Lighthouse designer will want to understand how you use your property and will tailor a task-specific design based your needs for safety, accessibility and usability long after dark. A Lighthouse designer will consider how and where you will be viewing your illuminated spaces from. Most of the time, we are inside looking outside, so understanding the placement of windows in relation to the landscape is important. Your windows looking outside should be the canvas to a beautiful piece of art. We work hard to frame our lighting designs to be inspiring from any window of your home. A Lighthouse designer will understand the dynamics of a living landscape. Plants grow and change over time, so your lighting system must be designed at the very outset to be able to be adapted to those changes as they occur. A Lighthouse designer understands how the colors, textures and features of your home will either absorb or reflect light, ensuring that they are designing the lighting with the proper lumens, color temperatures and optical manipulation to bring out the best in your architecture to make your home warm and inviting.